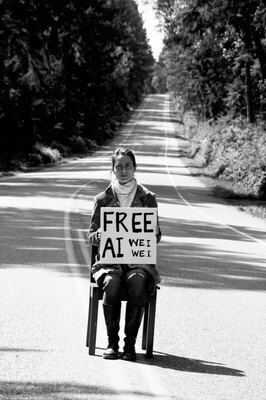 Betsy Eby sits in the middle of the road on Vashon Island Washington at 1 pm on Sunday April 17th 2011, as part of the World-wide protest 1001 Chairs organized by Creative Time NYC in support of arrested Chinese artist and activist Ai Weiwei. Ai Weiwei designed the 'Birds Nest Stadium' for the Chinese Olympics. Ai Weiwei was arrested in China in early April. I sit in my comfortable bedroom, looking out over treetops and the mouth of Quarter Master Harbour, Puget Sound, on Vashon Island Washington. There is a fine haze hovering over the water obfuscating Maury Island and the distant shore. Outside, the light is a pale hazy Spring gray. Inside, the fire in the fireplace, warms my room. I have been busy painting, with work and setting up the shows and the three-day Master Class/Holistic Painting Workshop in Georgia. A bit of a breather comes this morning. I am still trying to finish a painting for the Chicago Art Fair; and we have guests many days from off island. But, I find myself feeling particularly grateful. Grateful, that I am an artist, grateful that I am able to pursue my life’s work. The news of the world is overbearing and relentless. I take it in through slotted fingers; trying to limit my exposure: it is too much. No radio, no TV; I partake of quick glances at GoogleNews and whatever links come through my mostly Art related Twitter friends. It would be inaccurate to say that I am living an ostrich life. I know full well that there are continuing horrors in the world. Some are man made and some are natural disasters exacerbated by human failings; but daily, I am gauging my ability to withstand the onslaught of continual disasters, be they geo-political, environmental, natural, social, or economic. When living in self imposed isolation, social media does allow for some interaction on a larger scale with people of like mind. We can chose which voices we want to hear, and create our own version of reality accordingly. Activism consists of random acts of consciousness-raising, through Tweets and emails, and occasional blog comments. Philanthropy helps relieve the sense of helplessness. For many years I protested wars and police brutality in Philadelphia and Washington DC. But as of late, true activism seems to have taken a back seat, as painting has become the primary focus of my energies. I try to balance the intake of news with the very real work of making paintings in the relative peace of my quiet studio. I believe more and more in the theory that we can achieve enlightenment through a continued practice of the daily appreciation of beauty. Seeing beauty in the everyday, and translating it into a piece of art. At this writing, Chinese artist and activist Ai Weiwei has been arrested and held by Chinese authorities for over two weeks with no explanation. He has not been heard from. Other artists and activists in China have also been arrested and silenced. As artists, we are emboldened by the activism of Ai Weiwei. We admire his courage to stand up for his convictions, clearly knowing the risks and dangers. His arrest is meant to be a warning to artists. In China the government exercises “harmonizing”, to insure that dissident voices are silenced. In a heinous act of double-speak the Chinese have taken a beautiful word and inverted it into something quite diabolical (see Nick Kristof’s article on “harmonizing” here.) The arrest of Ai Weiwei suggests that if we are going to keep the assimilation of thoughts and ideas free flowing throughout society prompting our eventual evolution, we may have to be willing to risk everything. I don’t know a single artist who has chosen to remain quiet about Ai Weiwei’s arrest. The Twitterverse and blogosphere have been abuzz. The artists’ job is to wake us up. In this internet age the free exchange of ideas has to be more than window dressing. We can’t live within the thin veneer of freedom (that we delude ourselves in believing the free exchange of ideas on) the web provides. I like Andrew Seto’s recent tweet, “if you think outside the box you’d never use that phrase”. I am reminded of Andrew Wyeth’s last words to me, he said, “You’ve got to keep yourself free.” It is exactly what Ai Weiwei’s courageous works and actions have been exemplifying for years. We can’t allow ourselves to be silenced, censored or controlled, not by totalitarian regimes or by political correctness. Freedom, true freedom means being willing to stand for what you believe regardless of what the powers that be might have to say about it. In Art, we must say what we feel we need to say; we must paint exactly what we want to paint. Don’t be afraid of governments or critics. In creativity, true freedom might not make everybody happy. It will scare the crap out of the false authorities. There may not be harmony. But we will be evolving. They’ve also posted this link to the Frontline video on Ai Weiwei.